High-performance electric machines, such as motors in electric vehicles or generators in wind turbines, require rare earth elements, particularly Neodymium (Nd) and Dysprosium (Dy) for the electric machines’ magnetic components. In wind generators, the need for rare earths is quite large (a generator in a wind turbine contains approximately 100 kg of rare earth materials for every MW of rated power) and is still growing, as both the total amount of installed wind capacity and the average size of each individual wind turbine continue to increase. Price fluctuations over the past decade have shown that rare earth materials are sensitive to supply disruptions, and alternative technologies to mitigate or eliminate the dependence of this energy technology on critical rare earth materials would offer risk mitigation for the continued growth of wind power against potential market risks in the future. Using high-temperature superconductor (HTS) magnets in wind turbines could dramatically reduce the rare earth requirement compared with traditional permanent magnet (PM) generators (from ~100 kg of Nd and Dy MW in a PM generator to ~100 grams of rare earths per MW in an HTS generator). In addition, HTS generators offer better performance and lower weight for large turbines (see Fig. 1) with corresponding lower operational and capital costs. However, historically the highest performance commercially available HTS wire (Rare earth Element Barium Copper Oxide – (RE)BCO) ranged in cost from $200/kA-m upwards. To be competitive with PM generators, the cost of the HTS conductor must be reduced ~4x, which in turn requires a dramatic increase in the critical current (Ic, the maximum current that a superconductor can sustain). Advances in materials design and fabrication techniques make it possible to address this challenge by engineering specific defects, known as flux pinning centers, into HTS wires. Figure 1. 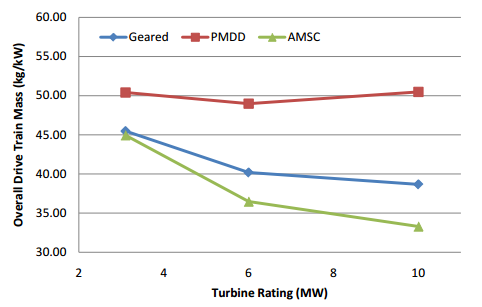 Comparison of overall drivetrain mass for permanent magnet (PM) geared, PM direct drive, and HTS (designed by AMSC) turbines. ARPA-E funded two teams in the Rare Earth Alternatives in Critical Technologies (REACT) program to develop advanced HTS magnet wire with high critical current: Brookhaven National Lab (teamed with AMSC) and University of Houston (teamed with SuperPower). The teams took different technical approaches to modifying HTS wire composition and structure to address this challenge. Both teams worked with (RE)BCO wire, which is manufactured commercially by epitaxial deposition of thin films (typically ~1 mm thick) onto buffered substrates on nickel alloy, or steel tape (see Fig. 2 for illustration). In magnet applications, the critical current in (RE)BCO films can be improved by introducing defects into the thin film, creating flux pinning centers that align and pin magnetic field lines (see Fig. 2 for illustration). The fundamental challenge in improving Ic in (RE)BCO for magnet applications is engineering these flux pinning centers to provide the optimal size, concentration, and distribution for the wire in operating conditions, which for HTS generators range from 1-3 T magnetic fields and 30-50 K temperatures. The BNL/AMSC team combined two approaches to engineeing flux pinning centers for AMSC’s (RE)BCO wire. The first approach leveraged nanoscale derivative phases and defects formed during the growth of AMSC’s metal organic deposited (MOD) (RE)BCO film. The team identified the optimal concentration of these defects for flux pinning at targeted operating conditions, and altered the design of the growth conditions to consistently produce this microstructure. The new process doubled the critical current. The second approach introduced additional defects through bombardment with high-energy ions. The team optimized the ion bombardment conditions and once again doubled the critical current. The ion beam treatment was performed at ion fluxes that are compatible with manufacturing rates on a moving tape. By the completion of the program, the team had demonstrated critical current of >1600 A at 10mm of wire width, for the operating conditions of AMSC’s HTS machine design. This represents a >4x improvement over the 400 A/cm width at program start. The UH/SuperPower team built upon SuperPower’s chemical vapor deposition (CVD) approach to epitaxial growth of (RE)BCO to introduce flux pinning centers in the form of BaZrO3 nanocolumns. The team tuned the CVD process to produce Zr-doped (RE)BCO films for maximum Ic at the operating conditions of the team’s HTS generator design. YBCO doped with 25% BaZrO3 produced the best performance, with BaZrO3 nanocolumns of 5 nm with an average spacing of 15-20 nm, yielding Ic levels greater than 3x over baseline performance prior to the project. The team also developed process improvements to enable the deposition of thicker films without degradation of crystal quality or discontinuities in the BaZrO3 nanocolumns. With the combination of increased flux pinning centers in BaZrO3 nanocolumns and high-quality films through the improved process conditions, the team achieved >4x improvement in Ic at production thickness, resulting in a record critical current density for flux-pinning HTS material. The UH team further demonstrated a critical current of 3900 A with greater thickness through enhanced deposition control. This is a >6x improvement over their 600 A rating at program start for their standard 12 mm width wire. Figure 2. Configuration of (RE)BCO HTS wire (courtesy SuperPower Inc.), (inset: Illustration of flux pinning centers in form of nanocolumns in (RE)BCO film). AMSC has successfully implemented many of the innovations developed in the ARPA-E REACT program into their mainline commercial production, with AMSC completing the upgrades to production line equipment to allow the routine formation of the optimized flux pinning microstructure. The upgrades have resulted in 2x improvement in Ic over pre-program wire. In March 2016, AMSC formed a strategic partnership with BASF to reduce manufacturing costs of HTS wire. This joint program will couple AMSC’s HTS wire technology know-how with BASF’s chemical processing expertise to develop a potentially low-cost manufacturing process at BASF. Success of this program and the involvement of BASF are expected to accelerate acceptance of HTS wire in both cable and coil based HTS applications. SuperPower has successfully implemented many of the innovations developed in the ARPA-E REACT program into their mainline commercial production as well, with SuperPower implementing 15% doping with BaZrO3 in their magnet wire production. The upgrades have resulted in 2x improvement in Ic over pre-program wire. SuperPower has continued to improve their wire and plans another 50% improvement based on REACT technology by 2017. Commercial wire from AMSC and SuperPower with ARPA-E technology has been purchased by early adopters including the U.S. Navy (for developmental systems in ship degaussing and protection systems), developers of scientific equipment (such as CERN, Lawrence Berkeley National Lab, and other builders of advanced accelerators) and a variety of other customers around the world. The demonstration of significantly improved HTS wire properties has removed a significant technical barrier to the development of HTS generators. However, there are still challenges in reliability, maintenance, and lifetime of HTS electric machines. A successful demonstration of a large-scale HTS motor or generator would have far-reaching consequences throughout the energy sector – enabling far higher power ratings for wind turbines of 10 MW; improving efficiency of electric machines such as industrial motors or power plant generators by 2-3%; and potentially even enabling hybrid-electric passenger aircraft. Martin W. Rupich, Srivatsan Sathyamurthy, Steven Fleshler, Qiang Li, Vyacheslav Solovyov, Toshinori Ozaki, Ulrich Welp, Wai-Kwong Kwok, Maxime Leroux, Alexei E. Koshelev, Dean J. Miller, Karen Kihlstrom, Leonardo Civale, Serena Eley, and Asghar Kayani, “Engineered Pinning Landscapes for Enhanced 2G Coil Wire”, IEEE Trans. on Appl. Supercond. 26 (2016) 6601904. S Fleshler, K DeMoranville, J Gannon Jr, X Li, E Podtburg, M W Rupich, S Sathyamurthy, C L H Thieme, D Tucker and L Whitman, “Development Status of AMSC Amperium® Wire”, J. Phys: Conf. Series 507, (2014) 022005. Vyacheslav F. Solovyov, Li-jun Wu, Martin W. Rupich, Srivatsan Sathyamurthy, Xiaoping Li, Qiang Li, “Two-stage epitaxial growth of vertically-aligned SnO2 nano-rods on (001) ceria”, Journal of Crystal Growth, (2014), 107–111. M. W. Rupich, X. Li, S. Sathyamurthy, C. L. H. Thieme, K. DeMoranville, J. Gannon, S. Fleshler, “Second Generation Wire Development at AMSC”, IEEE Trans. on Appl. Supercond. 23 (2013) 6601205. Vyacheslav F. Solovyov, Qiang Li, Martin Rupich, Srivatsan Sathyamurthy and Xiaoping Li, “New Pinning Strategies for Second-Generation Wires”, IEEE Trans. on Appl. Supercond. 23, (2013) 6600905. V. Selvamanickam, M. Heydari Gharahcheshmeh, A. Xu, Y. Zhang and E. Galstyan, “Requirements to achieve high in-field critical current density at 30 K in heavily-doped (Gd,Y)Ba2Cu3Ox superconductor tapes”, Supercond. Sci. Technol. 28, 104003 (2015). A. Xu, L. Delgado, M. Heydari Gharahcheshmeh, N. Khatri, Y. Liu, V. Selvamanickam, “Strong correlation between Jc(T, H || c) and Jc(77 K, 3 T || c) in Zr-added (Gd,Y)BaCuO coated conductors at temperatures from 77 down to 20 K and fields up to 9 T” Supercond. Sci. Technol. 28, (2015) 082001. V. Selvamanickam, M. Heydari Gharacheshmeh, A. Xu, Y. Zhang and E. Galstyan, “Critical current density above 15 MA/cm2 at 30 K, 3 T in 2.2 µm thick heavily-doped (Gd,Y)Ba2Cu3Ox superconductor tapes”, Supercond. Sci. Technol. 28, (2015) 072002. V. Selvamanickam, M. Heydari Gharahcheshmeh, A. Xu, E. Galstyan, L. Delgado and C. Cantoni, “High critical currents in heavily doped (Gd,Y)Ba2Cu3Ox superconductor tapes” Appl. Phys. Lett. 106, 032601 (2015). E. Galstyan, M. Heydari Gharacheshmeh, L. Delgado, A. Xu, G. Majkic, and V. Selvamanickam, “Microstructure Characteristics of High Lift Factor MOCVD REBCO Coated Conductors with High Zr Content” IEEE Trans. Appl. Supercond. 25, 6954395 (2015). A. Xu, N. Khatri, Y. Liu, G. Majkic, V. Selvamanickam, D. Abraimov, J. Jaroszynski and D. Larbalestier, “Broad temperature pinning study of 15 mol.% Zr-added (Gd, Y)-Ba-Cu-O MOCVD coated conductors”, IEEE Trans. Appl. Supercond. 25, 6603105 (2015). V. Selvamanickam, A. Xu, Y. Liu, N. D. Khatri, C. Lei, Y. Chen, E. Galstyanand G. Majkic, “Correlation between in-field critical currents in Zr-added (Gd,Y)Ba2Cu3Ox superconducting tapes at 30 K and 77 K” Supercond. Sci. Technol. 27, 055010 (2014). V. Selvamanickam, Y. Yao, Y. Chen, T. Shi, Y. Liu, N. D. Khatri, J. Liu, C. Lei, E. Galtsyan and G. Majkic, “Low-temperature, High Magnetic Field Critical Current Characteristics of Zr-added (Gd,Y)Ba2Cu3Ox superconducting tapes”, Supercond. Sci. Technol. 25, 125013 (2012). Martin W. Rupich, “Performance of AMSC’s 2G wire and R&D improvements”, HTS4Fusion Conductor Workshop, Pieve S. Stefano, Italy, Sept 11 – 12, 2015. “Analysis of future prices and markets for high temperature superconductors”, J. Mulholland, T. Sheahen and B. McConnell, June 2003, ORNL, U.S. Department of Energy. See Table 3, page 15.